HAYS— Phillipsburg sophomore Kirk Coomes had just 100 carries in the season’s first 12 games. Coomes served as the backup to senior Conner Weinman and was one of four Panthers in a regular backfield rotation. On Saturday, Weinman went down early with a collarbone injury in the Class 2-1A state championship game against Troy. Coomes entered the contest earlier than usual. The Panthers continuously ran one play – 33 Bone Iso – to the left side with Coomes as the feature back. He finished with 26 carries for 243 yards and four touchdowns. Phillipsburg’s rushing attack and defense held off Troy, 30-29, on a cold Saturday afternoon at Fort Hays State University’s Lewis Field Stadium. Troy missed a go-ahead two-point conversion with 3 minutes, 17 seconds left. With less than 90 seconds remaining, Phillipsburg faced 4th-and-3 from the Troy 43-yard line. The Panthers went with a hard count, Troy moved and was called for encroachment. Phillipsburg ran out the clock. Afterward, Coomes said he was “really sore” and could barely bend his knees as he slowly walked around in the postgame celebration. The play was the same one Phillipsburg ran at the end of the 2014 sub-state championship game, just in the other direction. Phillipsburg held a massive yardage edge versus Ell-Saline but fumbled at the 1-yard line in the final seconds and lost, 22-21. “It was the one play that we kept running over and over and over, and we just felt like we were picking up chunks there, and we had to stay with it,” coach J.B. Covington said. Phillipsburg (11-2) won the schools’ first football title in its initial trip to the state championship game. It marked Covington’s first crown in 18 years as a head coach, 13 with the Panthers. Troy, also in its first time at state, went 10-2. Troy junior quarterback Reid Greaser finished 17 of 24 passing for 298 yards and four scores. Coomes tallied a 4-yard run to give Phillipsburg a 30-23 lead with 10:28 remaining. Troy closed the gap to 30-29 when Greaser found junior Cuttar Huss for a wide-open 30-yard touchdown pass with 3 minutes, 17 seconds left. Troy immediately decided to try for a 2-point conversion. Greaser rolled out to his right and overthrew senior Chris Winkel in the end zone. “We felt like we have a great defense, and just told them basically, ‘It’s now or never, we’ve got to get a stop,” Covington said. Winkel collected five catches for 128 yards and two scores, including a pair of long circus catches. Huss had seven catches for 120 yards and a pair of touchdowns, and had five rushes for 34 yards. Troy led 9-0 after the first quarter and 17-16 at halftime. Coomes collected a seven-yard run early in the second quarter and then added a 54-yard run just over two minutes later. With 7:56 left in the third quarter, Coomes broke another big play for a 62-yard touchdown for Phillipsburg’s first lead at 22-17. Panther senior fullback Brock Means, one of the squad’s most experienced players, continually paved the way. 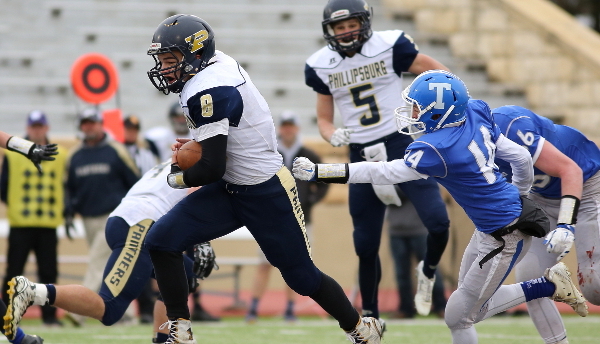 Troy held a 351-349 yardage edge, while Phillipsburg ran 66 times for 339 yards. Phillipsburg’s left side of the line with senior tackle Jace Gordon, senior tight end Nate Prewitt and sophomore wide receiver Trey Thompson also opened holes. Covington became emotional when he talked about Prewitt, a talented running back last year who hurt his knee in the offseason. Prewitt returned in Week 9 and played tight end the final month.